The cruiser heart with a checkered-flag soul. 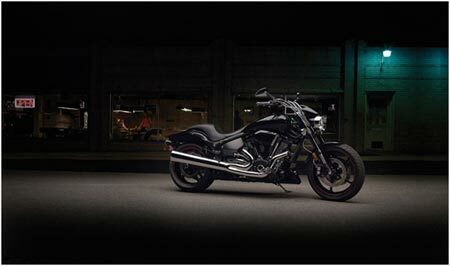 Nothing comes close to the unique style and the V-twin performance of the Warrior except the Midnight Edition, the all-black version of the four-time AMA Prostar drag racing champion. Feeling conflicted over whether you want the laid-back comfort of a cruiser or the exhilarating performance of a sport bike? Why not just have both? 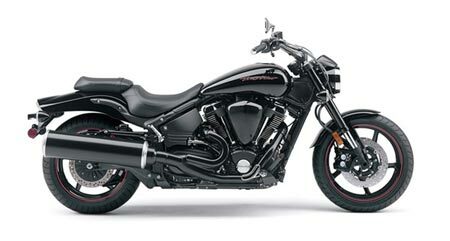 The Road Star Midnight Warrior took the cruiser’s low-end muscle and combined it with the handling and maneuverability of a sport bike. In fact, the suspension is derived from our championship-bred YZF-R1, and the engine is wrapped in a high-tech aluminum chassis. Whether you call the Warrior a power cruiser or a sport bike, you’re going to want to call it your own. – High-performance, air-cooled, long-stroke, OHV, 4 valves per cylinder, 48°, V-twin powerplant produces massive torque and strong acceleration. – Traditional pushrod valve actuation keeps engine height down for a lower centre of gravity and ensures more uniform heat dissipation due to absence of a cam chain case. – Twin, crankcase-mounted, high-lift cams ensure strong acceleration and horsepower. – Large-diameter pistons feature durable and lightweight, forged construction to accommodate higher-rpm performance with reduced vibration and less reciprocating mass. – 40mm, twin-bore, downdraft Nippon throttle body fuel injection (FI) with throttle position sensor (TPS) uses a high-capacity, twin-stage, air cleaner system ensuring optimal fuel delivery, great throttle response and maximum power throughout the rev range. – High-performance, 2-into-1-exhaust system features 38mm stainless steel header pipes and a massive muffler that boosts torque and horsepower while producing a throaty, V-twin growl. – Dry sump lubrication system means a more compact engine design because the oil tank is not part of the engine, which lowers the centre of gravity for great handling. A handy, spin-on oil filter means fast, easy oil changes. – Smooth-shifting, 5-speed transmission features close-ratio gearing for spine-tingling roll-on performance at all rpms. – Clean, quiet, low-maintenance belt drive system uses a special, narrow design belt that reduces unsprung weight for great rear suspension performance. – Air Induction System (AIS) injects fresh oxygen at the exhaust port to insure complete combustion thereby reducing harmful exhaust emissions (HC & CO), while a special air cut valve reduces backfiring when decelerating or coasting off throttle. – Lightweight, aluminum, double-cradle frame increases rigidity by 40% (over standard Road Star frame) and offers tremendous strength and durability with minimal flex. This aluminum frame design is an industry-first for a cruiser-style motorcycle. – Incredible, 38 degree lean angle ensures sporty handling (typical cruiser lean angles are approx. 30 ~ 33 degrees). – Sport bike inspired, aluminum, box section swingarm offers superb rigidity and a forward-mounted pivot point that ensures excellent stability, traction and handling. Another industry-first on a cruiser-type motorcycle! – Highly rigid, preload adjustable, 41mm Kayaba inverted fork offers 135mm (5.3″) of wheel travel for exceptional sport-oriented handling. – Beefy, cast aluminum top and bottom triple clamps help increase fork rigidity and reduce weight. – Link rear suspension features a preload and damping adjustable single rear shock delivering outstanding rear wheel tracking for precise handling and plush ride quality. The shock is hidden to provide that classic “hardtail” look. – Rear shock adjustments include: spring preload and 18-way rebound damping. – Dual 298mm front disc brakes feature radial mounted, ultra rigid, 4-piston, monoblock calipers with fully floating rotors to provide sport-bike spec stopping power. Radial mounted calipers provide exceptional stopping power with great lever feel and feedback. – “R-series” inspired lightweight 5-spoke mag wheels reduce weight and enhance handling qualities. These mag wheels are fitted with tubeless 120/70-ZR18 front and a huge 200/50-ZR17 rear radial tires that provide awesome traction. – Two-piece seat design features a wide, flat profile for excellent rider comfort. The passenger seat features a flip at the rear of the seat providing a secure feeling for the passenger. – Totally trick, brushed aluminum, headlight-mounted, digital tachometer also incorporates the odometer, dual tripmeters, fuel reserve tripmeter and clock.